Traditional mole (pronounced Mol-ay) involves up to 30 ingredients and hours and hours of cooking. But panic not, this is definitely a less elaborate version than that! And it’s just as good as, if not better than, any of the moles I’ve had out and about. I think this is one of the best things I’ve ever cooked. Bold statement I know, but true! On a gentle heat, warm the olive oil and fry the onion until soft. Then add the cinnamon, chipotle, cumin, thyme and cloves. Cook it for around 5 minutes on the same low heat. Turn the temperature up and add the tomatoes and chicken stock. Bring it to a simmer, then cover. After 30 minutes, add in the juice of half a lime, the muscovado sugar and the chicken, and cover it again. After another 30 minutes, stir in the chocolate and sugar. If it has reduced down too much, add another ladle of stock or water and cover. After another 30 minutes, your incredible Mole Poblano is almost ready. The final step is to remove the cinnamon stick, thyme sprigs and the chillies. As lovely and smoky as chipotle chillies are, you probably don’t want to bite into one! Serve with corn tortillas, guacamole, coriander, sour cream and very hot sauce. 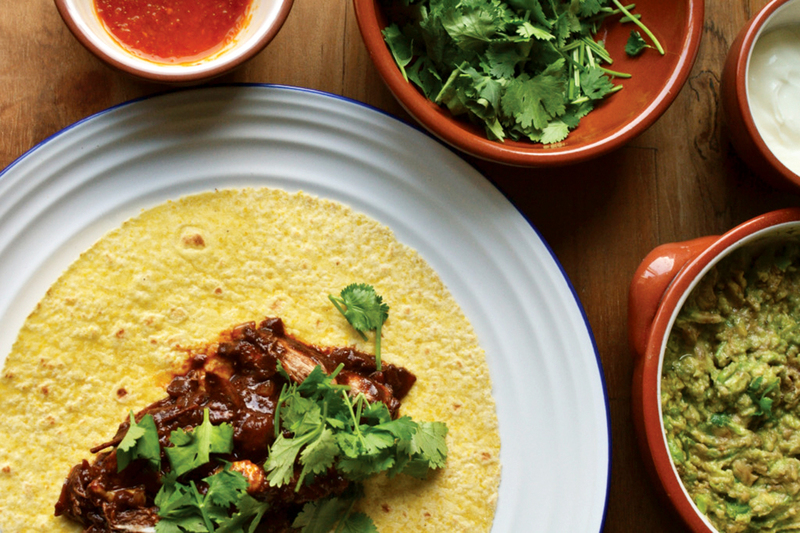 Join the meat lover tribe with this tasty Mexican classic. Rustle it up on an elegant Leisure range cooker. Choose from a large range of beautiful colours, take a look at our selection of silver range cookers, stainless steel range cookers and blue range cookers.